This Old House landscape contractor Roger Cook shows you the best ways to get rid of leaves for any size yard. In this video, This Old House landscape contractor Roger Cook shows the best ways to collect leaves for any size yard. 1. 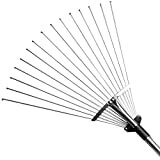 Use leaf rake to rake leaves into a pile. 2. Rake leaves onto a plastic tarp, then drag the leaves over to the compost pile. 3. If collecting leaves for town pick up, dump the leaves into a paper bag. Use a cardboard collar to hold the bag open. 4. Use portable leaf blower to corral leaves into a pile. 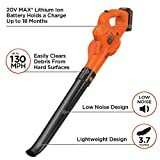 This type of tool is best for clearing small yards, driveways, patios and walkways. 5. For medium-size yards, use a walk-behind, gas-powered leaf blower. 6. Use a walk-behind power vacuum to collect and shred leaves. When the collection bag is full, dump the leaves into the compost pile. 7. 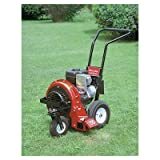 A heavy-duty leaf vacuum attaches to a riding lawnmower and has an impeller that grinds up leaves, reducing them to a 10-to-1 ratio. Q: Can I mulch my flower beds with oak leaves?